The rule of thirds is one of those basic rules of composition that I like playing around with to see the different effects it can have on the same subject. Basically you make a tic-tac-toe grid on your camera (a lot of cameras will have an option for you to display the grid on your screen) and then you put objects of interest on the intersections of those lines. If you have a bit of time, here’s one of my favorite silly DigitalRev videos – Teaching Girls How to Take Photos (SPOOF PARODY). There’s an amusing part where Kai likens the rule of thirds to a waffle – bam, bam, bam, BOSH! 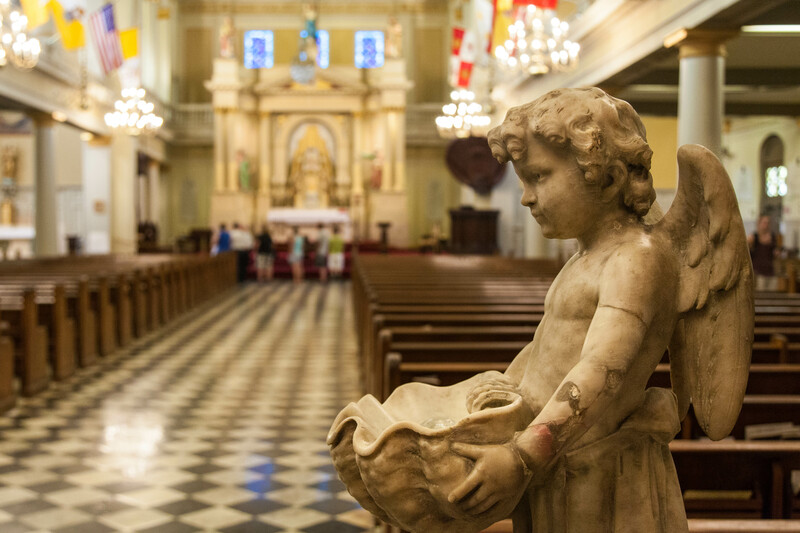 This was taken in New Orleans, in the St. Louis Cathedral in Jackson Square. If you can imagine the grid, the statue is on the right hand line and the altar in the blurred out background would be on the intersection of the left and top line. So it adds a bit of interest to have something in the foreground and also in the distant background too, all on those points of interest. And the rule of thirds is so nice, I had to do it twice! 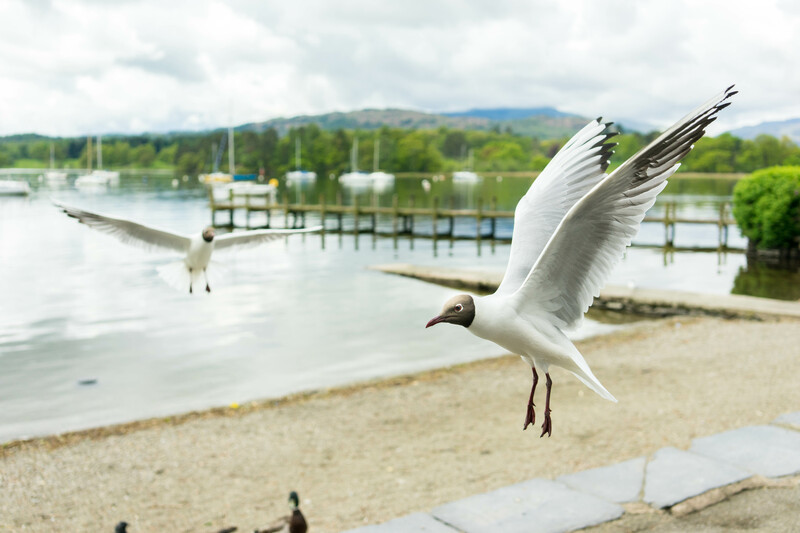 This photo was from a trip to England in the Lake District. The bird in focus is once again on the right line, and the second flying bird in that top corner intersection again. I also like the lines of the piers in the background as well, lending a bit of visual interest. And if it’s the rule of thirds, you gotta finish it off with a third picture right?! 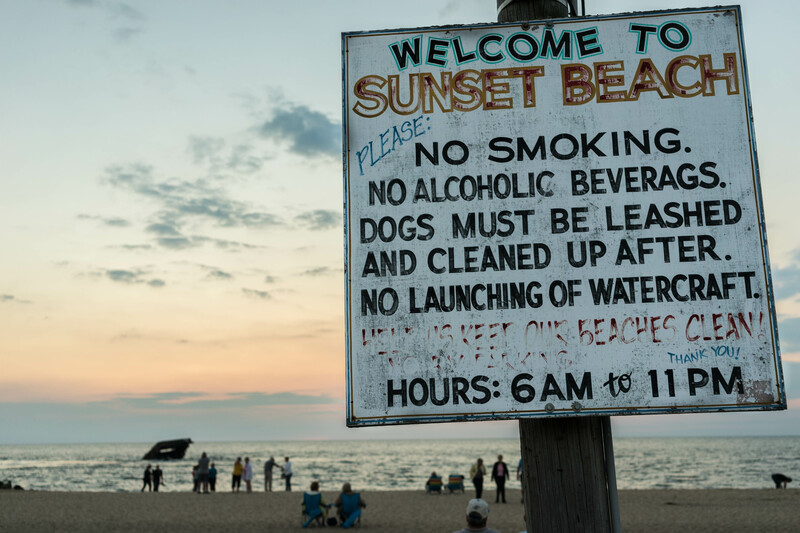 Goodbye with a sunset at Sunset Beach in Cape May, NJ! After fresh snowfall (of which we have had a lot up here lately) the world seems blanketed not just in snow, but also in a thick layer of quiet. Everything is hushed and muted by the fluffy snow, perhaps also because ones ears are bundled up in a hat or earmuffs. 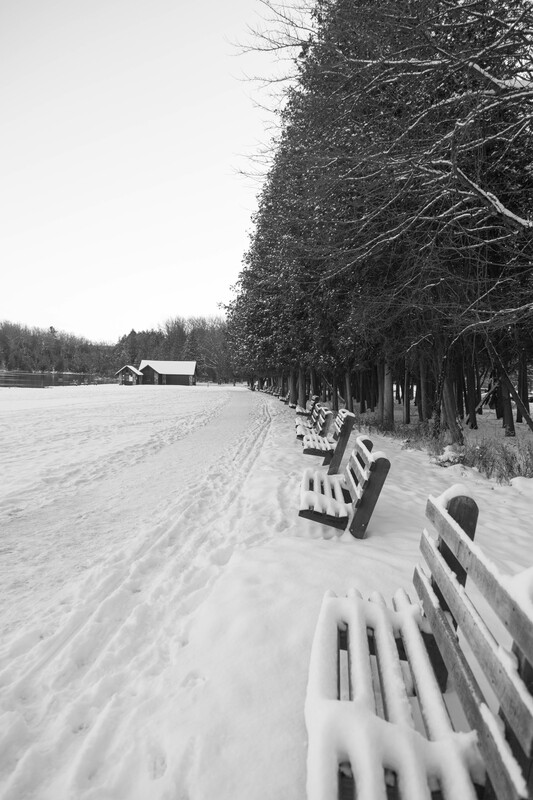 And there’s no place quieter than a park on Christmas Day after fresh snow. Black and white photography has never really been one of my strong points – so that’s why I’ve decided to take on some B&W challenges to explore the world of monochrome photography and push my own limits. 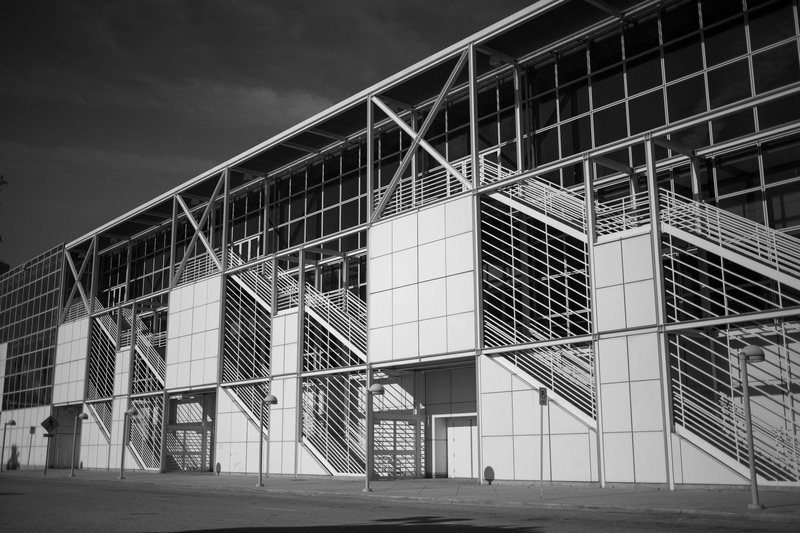 Without color, certain aspects of a photo come more into focus and it’s interesting to see how black and white can make an otherwise flat photo look dynamic… and vice versa! When I originally took this photo, I wasn’t too impressed by it. I liked the pattern of the lines and the angle of the photograph, but overall it was just kind of “meh”. However, once I put it into black and white the pattern of the lines really popped! I actually like it a lot better as a B&W vs the original color version. I’m the kind of person that my travel companions roll my eyes at while I stop to take a picture of something mundane – I can’t help it, I like to capture every little detail whenever I’m on a trip! That includes food… yes, I’m very guilty of that, sorry! 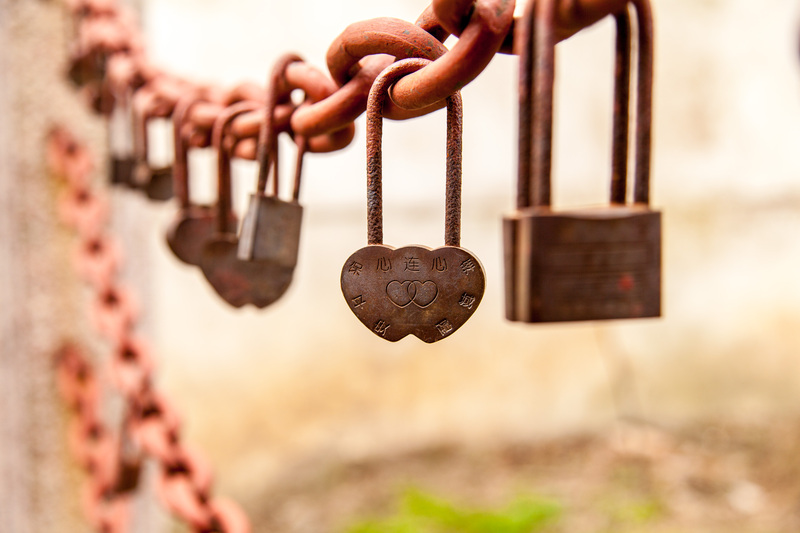 But when I look back at my pictures, I find that oftentimes it is those photos of little details that bring back specific memories and feelings for me. 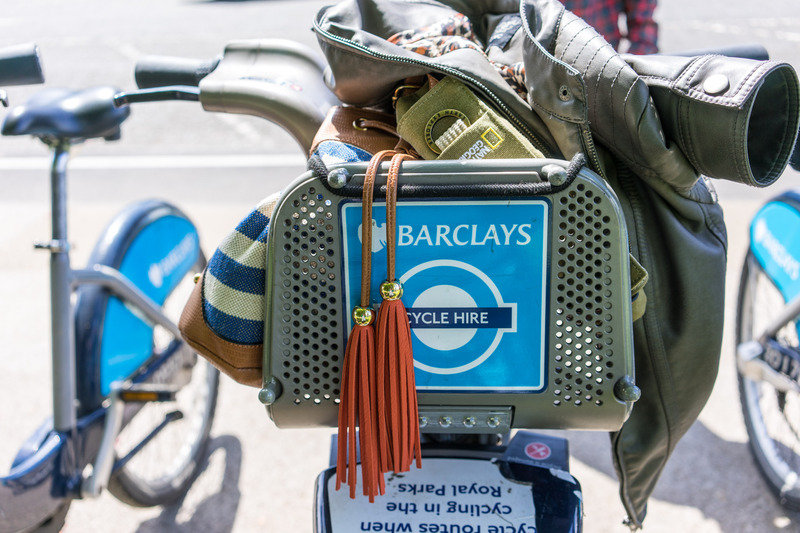 This photo reminds me of cycling around Hyde Park and Kensington with the rental bikes. It was a nice because we only paid £2 to use the bikes and then as long as we re-docked them within 30 minutes it was still free. So we probably biked 2-3 hours around with those bikes, docking them and then checking them out again at 30 min intervals. We even had time to go have tea at the Orangery and then come out and ride again! 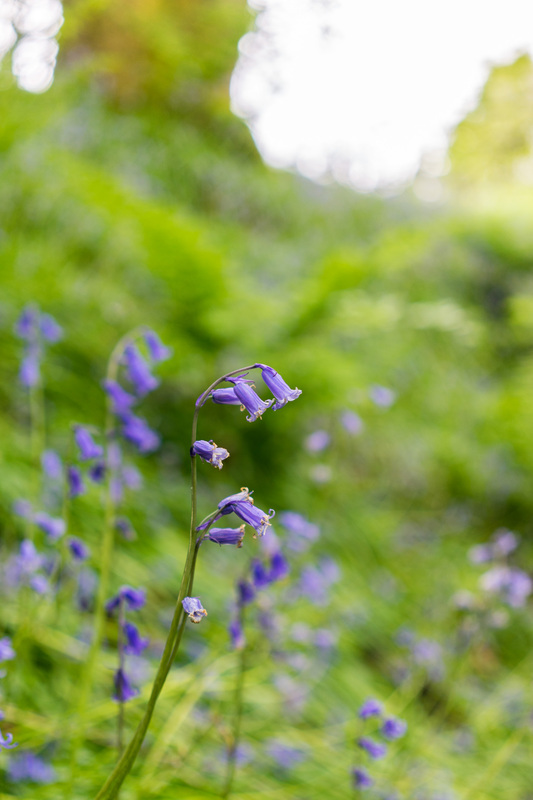 We visited the English countryside of the Lake District, and the fields were filled with lovely bluebells! I love their delicate shape and brilliant color. We stayed at a lakeside hostel that was a 15 minute walk to town – which meant that we saw many fields of flowers, cows and sheep! My college friends and I try to visit our alma mater once a year – it’s become a tradition to rent a house, play games and have a BBQ. 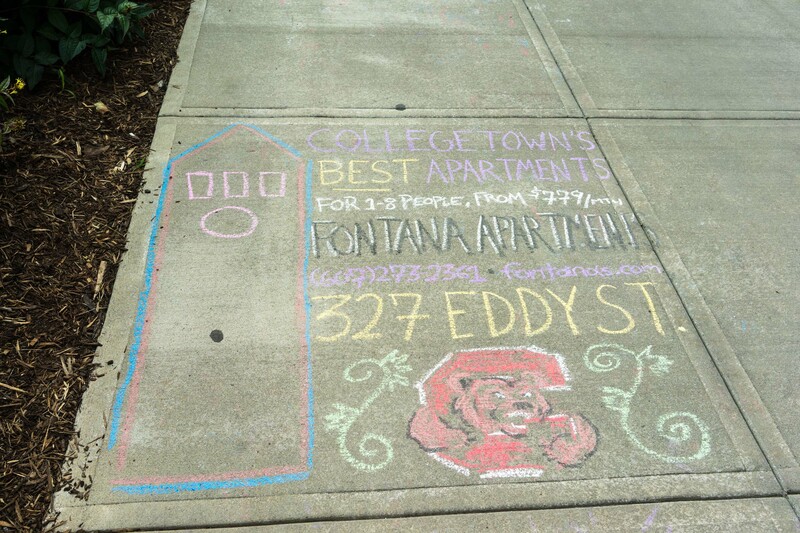 While walking around campus last year, I saw this chalk drawing on the sidewalk – we used to live in Fontana Apartments during our senior year! Ahh… brought back some nostalgic memories. 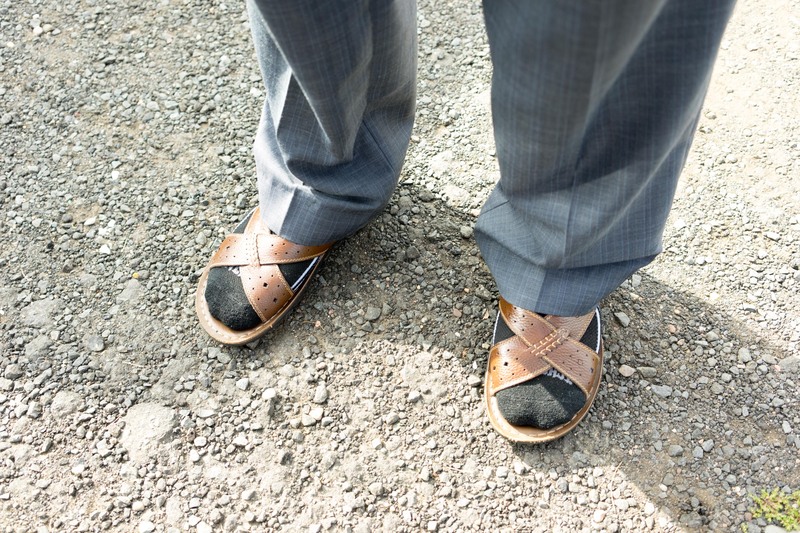 This was what my father felt was appropriate footwear for my cousin’s beach wedding. I was considering saving this picture for blackmail, but it wouldn’t work because he feels no shame at all. Another cousin, another wedding. 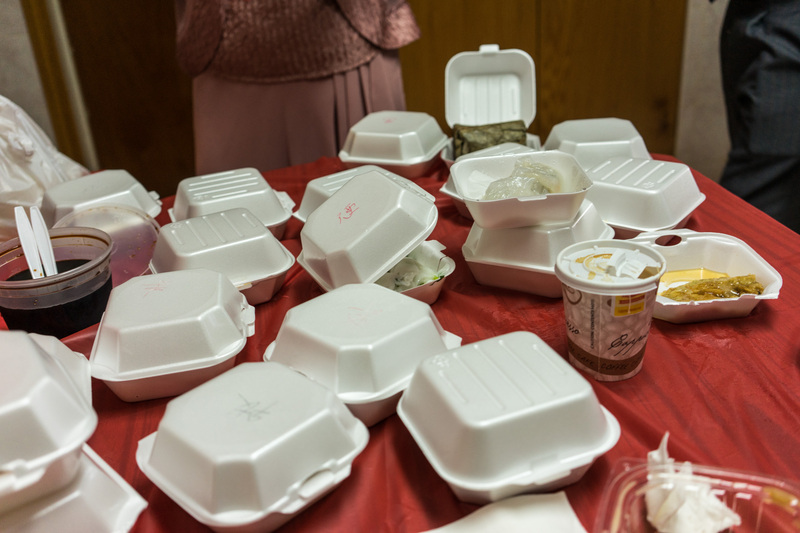 This is their kitchen table the morning of the wedding day, filled with takeout boxes of delicious dim sum sustenance for the family and the bride and groom to feast on before the long day ahead. Just looking at this picture reminds me of the cheerful bustle in the house, everyone talking over each other and fighting for the last shrimp dumpling. This was from a trip to China, when we were visiting a local temple. 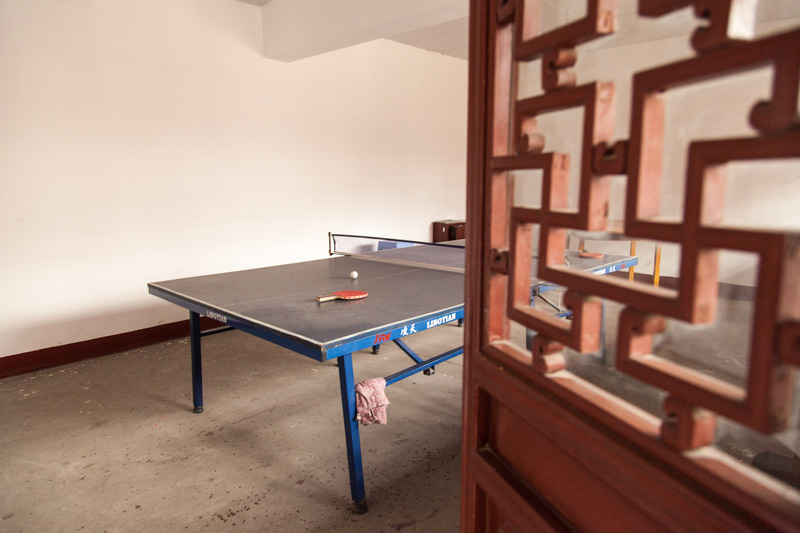 The whole atmosphere was very solemn and reverent as we were looking around… and then you peek into a room and see a ping pong table. I guess even solemn and reverent needs to take a break sometimes! Maybe it’s because I’m short, but I’ve always been acutely aware of scale. Especially with a tall husband, if I’m not on my tippy-toes or in heels I am dwarfed by him – and the fact that he’s tall and skinny whereas I am short and normal…. he makes me look shorter and fatter. Argh! Stupid scale! In any case, using scale is a great way to emphasize how big or how small something is. Case in point – my daughter was born in November, a preemie at 6 weeks early and she was a tiny little thing! 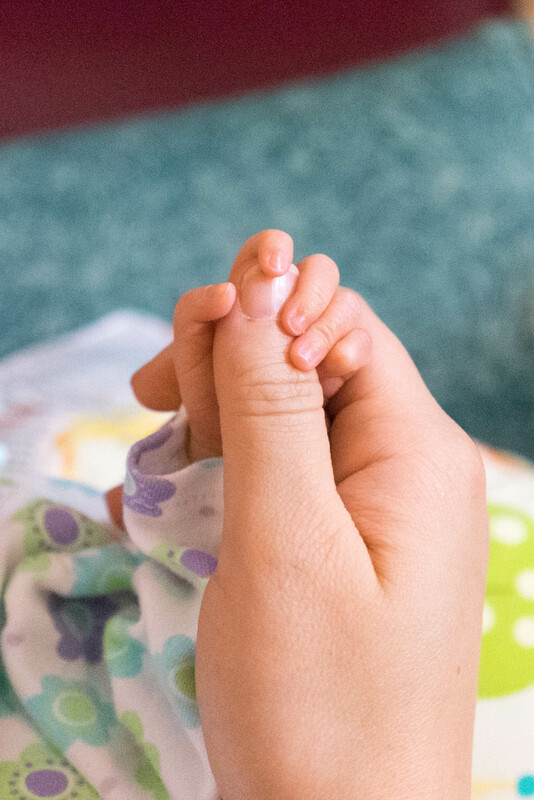 Her little fingers compared to my thumb make her seem even smaller and more delicate. Now she’s grown so much that her little hand wraps around my whole thumb! By this time in these parts, we should be firmly in the chilly grip of old man Winter – yet here we are in December and I was walking around in my fall coat in 50 degree weather! Truly this is frightening for one who expects snow or at least hat and gloves weather by this time! I probably shouldn’t be complaining about it – after all, if it was as cold as expected I would probably be complaining about that too! But I guess that’s human nature. Then again, it’s not really winter yet – the winter solstice will be on Dec. 21st which technically marks the first day of winter. But still, where’s the snow, freezing rain, and sleet that make winter driving so annoying? Did I put my snow tires on for nothing?! Leaves of deep summer green, just starting to get tipped by the brilliant autumn scarlet. A few days later the color had crept further up, and within a week the transformation was complete – flame red leaves, a tree afire. 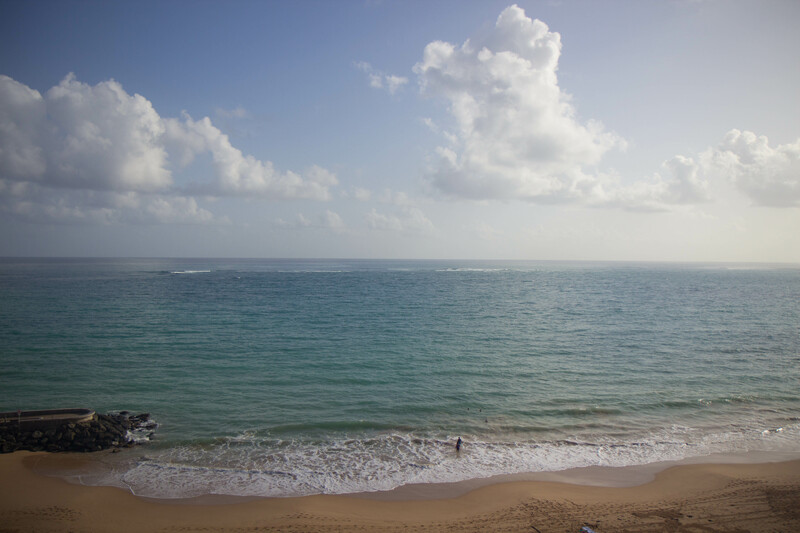 It wasn’t until I opened the curtains to this gorgeous ocean view that I really felt like I was in Puerto Rico. It had slowly been settling in since we stepped out of the airport and into the warm, humid night (highs of 90 and lows of 75, anyone? ), and even while Susie was haggling our transportation in fluid Spanish ($4/person including luggage to Condado!). But it didn’t really hit me til I was standing on the balcony, listening to the rhythmic thunder of the waves and feeling the heat on my skin.